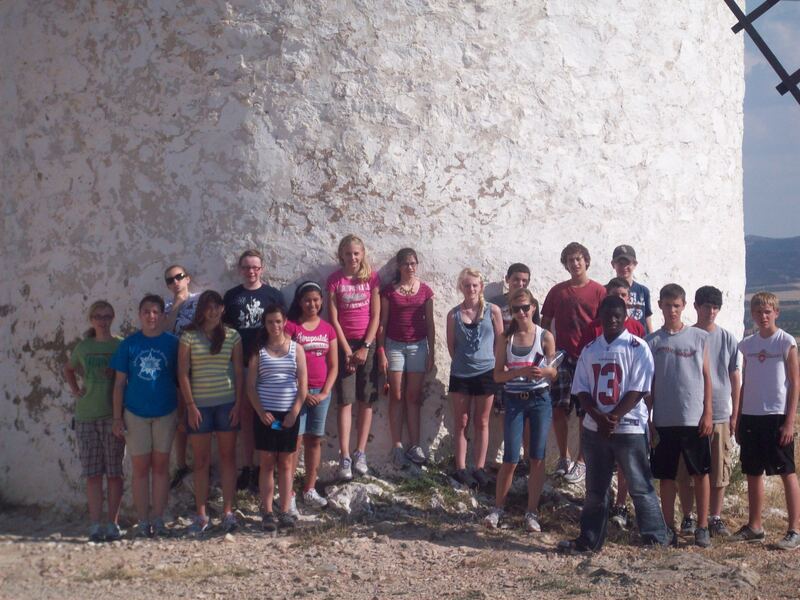 Our Spain group just after they attacked a completely innocent windmill. In June 2011, we spent 12 days exploring the Iberian Peninsula. This trip took TAP to four different countries on two continents (three if you count starting and finishing in North America). We started in Portugal, moved on into Spain, traveled down into Gibraltar, then crossed the Mediterranean into Africa to tour Morocco. This is the first trip that TAP decided to be brave and not just select a pre-determined package out of EF Tours catalog, this time, of course with some help from the experts at EF, TAP decided to think about exactly what the students would want and designed their own customized tour of Spain and Portugal. It was also the first time in TAP history that the same exact group of teachers returned for two trips in a row – Mr. Curtis, Mrs. Harig, Miss Lara, Mr. Doerr, and Miss Filetti led the way, but Mrs. Vertin and Mr. Sowa from MIS and Ms. Bialek from MJHS tagged along as part of the gang. Mrs. Harig’s husband also joined us, marking the first TAP teacher spouse to travel with the group. Our fifth adventure started in Lisbon, Portugal. Within minutes of meeting our tour director, Juanito, and taking our first brief stroll around Lisbon, we knew this was going to be another amazing adventure. Juanito is one of those Renaissance Man sort of guys that’s just a blast to be around – he’s part of the French Foreign Legion, studying survivalist training, rock-climbs, practices martial arts, and was working towards a Master’s in French literature. Those areas of expertise led to some amazing experiences, because Juanito wanted nothing more than to make every moment of the trip better than the last. A view of Lisbon from atop the elevator. Lisbon was immediately, and is still, among our favorite cities. It’s walkable, friendly, and full of character and charm. The hilly cobblestone streets make it one of the most unique hikes we’ve ever taken. The trams rolling up and down the streets, along with the view of the bay and its bridges make it so quaint and beautiful. 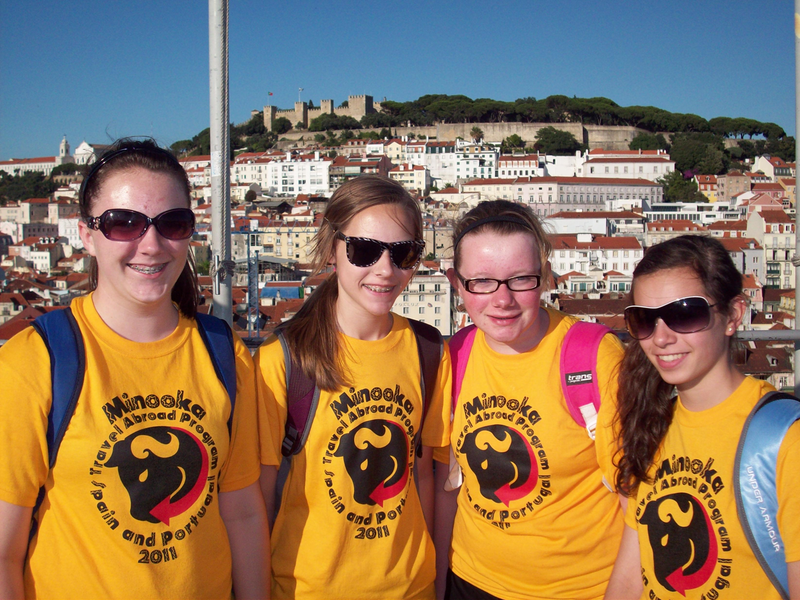 We started our tour visiting the waterfront, moving slowly inland to the Jeronimos Monastary all the way up to the Castelo de Sao Jorge (St. George’s Castle) where we were up above the entire city with an amazing view. The day ended at a small restaurant where we ate and drank while Portuguese singer performed traditional Fado music, sweet, soulful songs that were beautiful even though we couldn’t understand a single word. We could have stayed another week in Lisbon, but after two days it was time to head onward. For a bit more about our time in Lisbon, check out this post or this post. Evora was the next stop on our adventure, and we couldn’t have found a cooler little city to stop in. There was a beautiful church, an enormous Roman aqueduct that ran off into the mountains, orange and olive trees all over the place, and the ruins to a Roman temple to the goddess Diana. But the highlight of Evora was Capela dos Osos – The Chapel of Bones. Yep, that’s right, an entire Christian chapel made out of human bones. It was at the same time one of the eeriest and most intriguing things I’ve ever seen. After Evora, we headed south to the Mediterranean coast of Portugal, staying in a wonderful resort area called the Algarve district. In three days we managed to take walks on two coasts, wading in the surf of the Atlantic in Lisbon and the Mediterranean Sea in Algarve. We said goodbye to Portugal and headed into Spain the next day. Seville was our first stop, and we were lucky enough to get a tour of Seville’s famous bull fighting ring. No bulls were present that day, but we did get to see the entire place, beginning with the training rooms, a trophy room and museum, and finally stand out there in the sunshine, the entire ring around us, walking in the footsteps of the famous matadors. That afternoon we had our first taste of the Spanish delicacy, paella, a rice dish cooked slowly for hours and hours with an assortment of seafood, chicken, and vegetables. It was just the first paella for us, because we couldn’t get enough of the dish. We walked that lunch off with a tour of the Cathedral of Seville – the third largest church in the world. We explored the entire inside, then hiked all the way up to the top of the highest bell tower. Finally we strolled through town to see the Alcazar, a fortress where Columbus’ journey to America was planned, and the Plaza de Espana, a beautiful pavilion built almost 100 years ago and used recently to film Star Wars movies. There we encountered a homeless guitar player who spent nearly an hour with our group, teaching (with Juanito’s translation) about Spanish guitar music. He sang several songs for us and sent us on our way with a new friend in Seville. 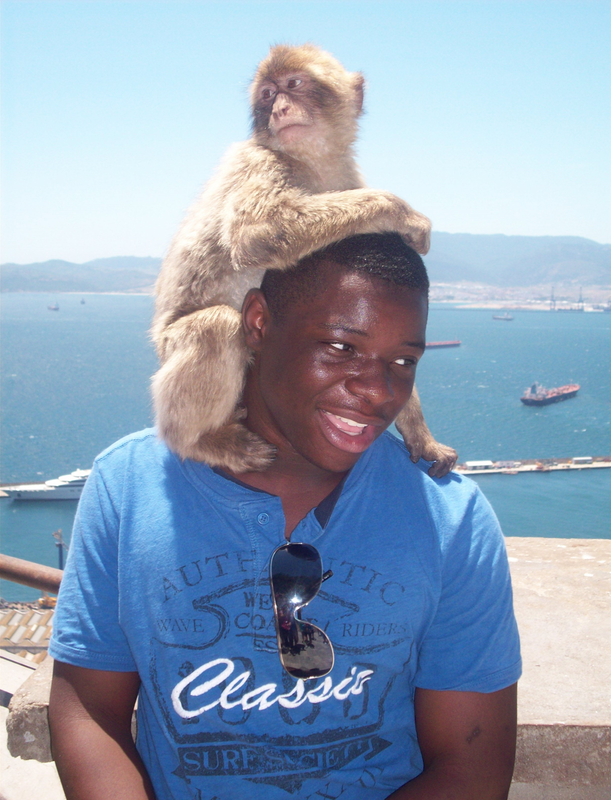 Josh made friends everywhere he went, even in Gibraltar. Crossing the border into Gibraltar was quite an experience. In order to save the money we would have had to pay to bring our bus into the country, we got out of the bus in Spain and crossed the border on foot. The strange thing, since Gibraltar is such a small country, and space is at a premium, the border is a working runway for the Gibraltar airport. That’s right, we had to walk right across the runway, stopping for a bit so a landing jet could taxi across our path. The entire country of Gibraltar is probably smaller than the little town of Minooka where we come from, but there’s so many cool things to see. The Rock of Gibraltar itself is awe inspiring, but going down into the caves within the rock, seeing where British servicemen dug the siege tunnels during WWII to protect the mouth of the Mediterranean – the Straits of Gibraltar – was so cool. Those tunnels have barracks, a hospital, and even a church built into them. We had a little free time to stroll around town, but everyone’s favorite was the Gibraltar Rock Apes, the only wild apes on the European continent. The apes were incredible to see, and we got a bonus, seeing a baby that was born just hours before we arrived. You’re not supposed to interact with the apes, but they don’t seem to know that rule, so while we posed for pictures at the top of the Rock, Africa and the Mediterranean behind us, the apes decided to start photo bombing, then became the focal point of the pictures by climbing onto a few of our kids’ shoulders and heads. What an experience! The next day was a first for everyone in the group. We hopped on a ferry boat and made our way across the Mediterranean Sea to Morocco. It was the first time any of us had been in Africa, and right away it felt like being in a strange movie. The whole day felt surreal, as if what we were seeing wasn’t real. Europe is so very similar to America in so many ways, but the village and market we visited in Morocco were totally foreign. We got to ride on camels in the desert for a bit, then explored the market place, making stops in a spice/medicine shop where we learned all about Moroccan holistic medicines. All throughout southern Spain, strewn about the hillsides are the Pueblos Blancos, or the white villages. Ronda is one of those towns filled with whitewashed stucco buildings, built right into the hills, it’s one of the most picturesque towns we’ve ever visited. Unfortunately, we had a jam packed schedule, so we didn’t have a lot of time in Ronda. We stayed there one night, but we didn’t arrive until dinner time and we had to leave the next morning right after breakfast. To get a chance to see Ronda, we allowed the kids to make a choice – give up some sleeping time if you want. The teachers and Juanito planned a walk around town after dinner, watching the moon rise over the gorge, trekking across the bridge that connects the two parts of town, seeing the town square where a pivotal scene in Hemingway’s For Whom the Bell Tolls takes places, and even stopping for pictures at a cafe bearing Papa’s name. The kids were allowed to stay back in the hotel to catch up on sleep, and one of the teachers would stay behind, but not a single one wanted to miss out on the adventure. In fact, they all found Ronda so charming, that they all decided to wake up an hour and a half earlier the next day to take another walk around and see the spots we missed. More about Ronda in this post. 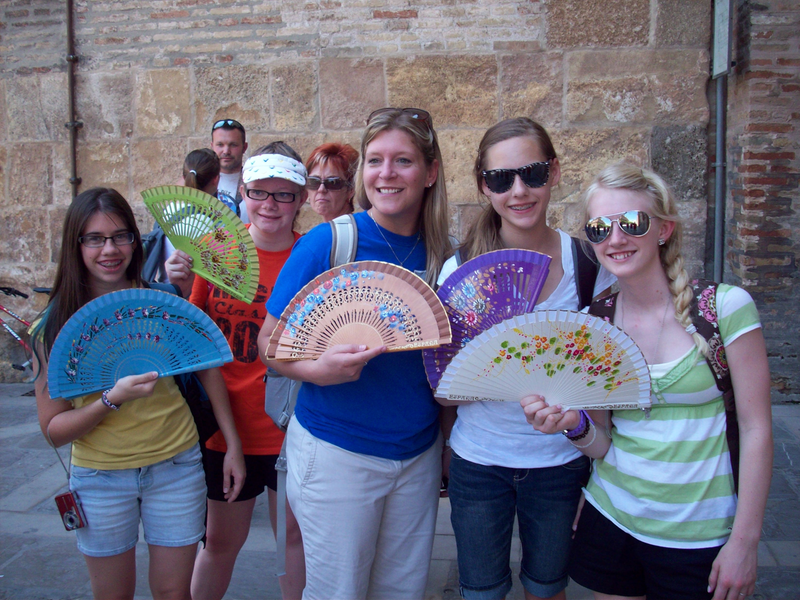 Miss Filetti and the girls showed off their Spanish fans. On the way to Cordoba, we took a walk through Tablas de Damiel, a wetlands conservation area where we got to commune with nature and see some Spanish wildlife. Cordoba was a gorgeous city, most famous for the Great Mosque of Cordoba, which was the pride and joy of the city, changing hands many times throughout history, serving as both a mosque and a church at various times. We could see easily why it is on many travelers’ must see lists. It was really fun to see Juanito in his hometown, Granada. He showed us where he lives and we met his girlfriend and his mom, who both spent quite a bit of time with us the rest of the trip. Granada is best known for a Moorish palace called the Alhambra. It did not disappoint, and to this day I have a hard time deciding if Granada’s palace or Cordoba’s mosque was the more amazing building. The Alhambra may get the vote if you get to include the beautiful garden surrounding it, and the view of the city spread out below. It’s the smaller towns like this, getting away from the hustle and bustle of the big cities, that makes TAP so much fun. Don Quixote, a 17th century action/comedy story by Miguel Cervantes was the focus of a great deal of our studies before the trip, and we finally made it to his home, La Mancha. Walking in his fictional footsteps was an unbelievable experience. I knew the kids “got” the story when all eighteen of them started to get excited when we first saw the windmills up on the hillside in the distance. By the time we parked the bus, they’d all made their plans and dashed up the hill to attack the evil giants. We hiked around and even got to go inside one of the windmills to see how it really worked. Then it was down to the town below, where we made a stop at the very inn Don Quixote stopped in at the beginning of his story. No, the story wasn’t real, but Cervantes based his settings on real places. A few of the boys acted out the inn scene right there in the courtyard while the rest of us shopped for Quixote souvenirs. 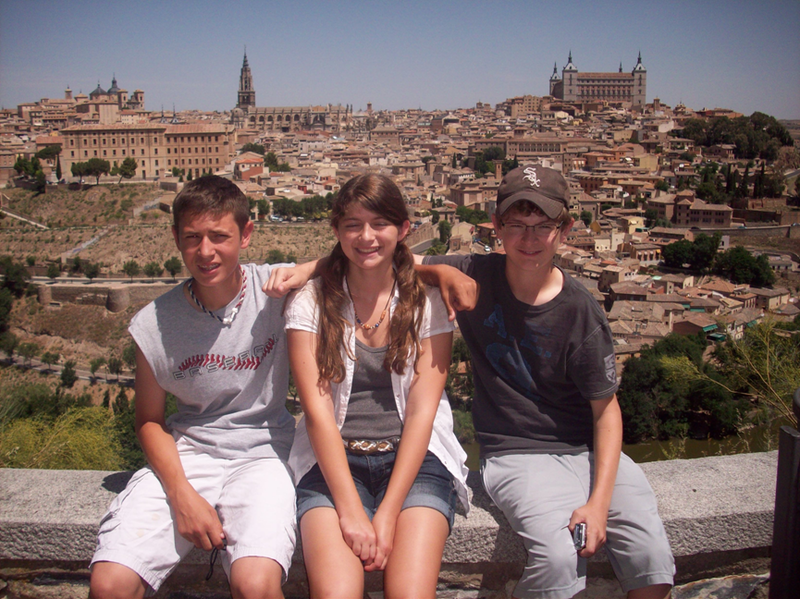 Minooka kids enjoyed a View of Toledo. Art was the focus when we stopped in Toledo. The famous painter, El Greco, lived in town, and many of his most famous works were landscape paintings from around town. We were lucky enough to get a private tour of a small art gallery where the guide spent a great deal of time explaining one of El Greco’s paintings to us. We also got to spend time in a sword shop, where the owner showed us how his family had been making swords and other weapons in that same location since medieval times. Since very few people need a sword for war nowadays, they now make replica swords for movies like The Lord of the Rings and the Harry Potter films. More on Toledo in this post. Segovia is a beautiful little town in the mountains north of Madrid. There’s a huge aqueduct that runs through the town, a gigantic reminder of the Roman Empire’s far reach. The best part of Segovia, though, is the castle – it’s a picture perfect castle that legend says Walt Disney was inspired by to create Sleeping Beauty’s castle in Disneyland (we also saw the castle that inspired Cinderella’s pad at DisneyWorld while we were in Germany in 2007). The castle was incredible, but it was the views that took our breath away. Those of us that read For Whom the Bell Tolls had a little bonus excitement, knowing that the guerrilla fighters in the novel were hiding in the mountains we were looking out at from the castle tower. 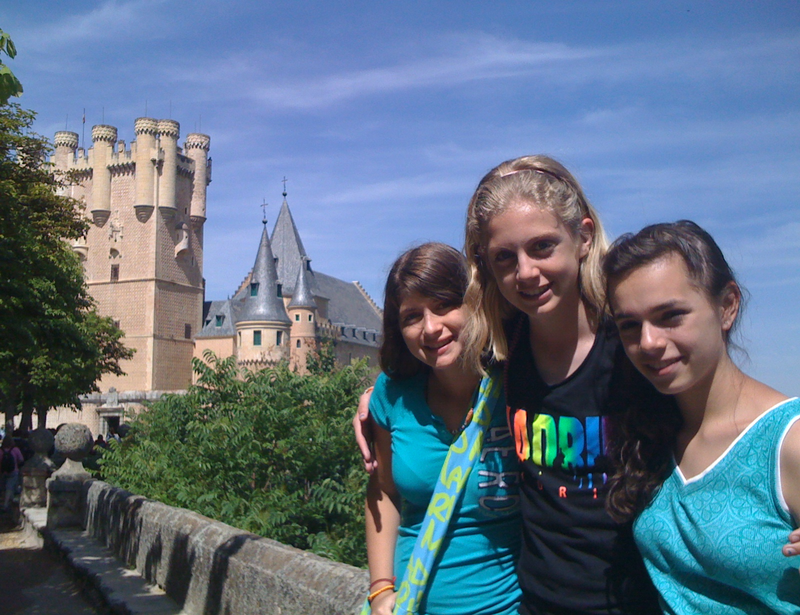 Segovia Castle was one of our favorite places in Spain. Our final stop was Madrid. The country’s capital has so much to offer. Art museums, shopping districts, an Egyptian Temple, palaces, and countless experiences to savor made Madrid a perfect way to wrap up our Iberian adventure. Our last night was spent walking through the squares in the middle of Madrid, watching the street performers, enjoying a tapas dinner and a performance by a group of Spanish troubadours, and best of all – a night watching Flamenco dancers and musicians perform. Singing, dancing, and laughing – that’s what we’ll remember from Madrid. Every year someone asks us what our favorite trip was, and every year it’s hard not to answer with the one we just took. Each adventure is so unique and the people we share it with make it so special that each one really does top the last. In 2011 we visited four different countries on two continents. We rode camels, befriended apes, ate cactus, attacked windmills, climbed towers, sang and danced with performers from all walks of life, and made friends that we’ll have forever. For sheer variety, it will be hard to top this one. Spain, Portugal, Gibraltar, and Morocco are all amazing places that we’ll never forget. Here’s a few more pictures from Spain, Portugal, Gibraltar, and Morocco.